Complete through Edge of Extinction, Episode 6. Click contestant name/picture to view their contestant page. What do we mean byTrChW? 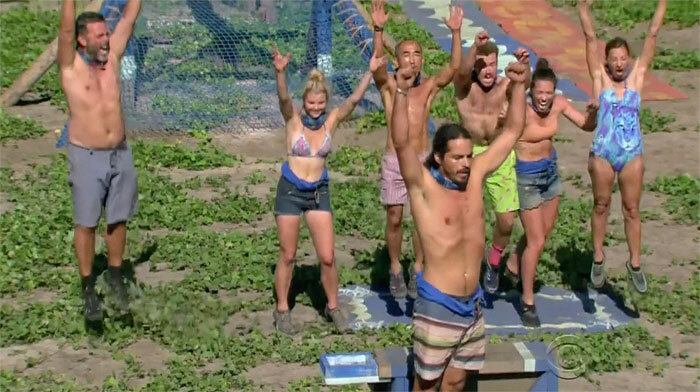 "Hero challenges," in which one to three people compete for the benefit of their tribe (as in Ozzy vs. Coach in the opening RC in South Pacific), are technically tribal and/or team-based, but are counted separately. Similarly, the duels in San Juan del Sur that were for tribal reward are not counted. We made a separate column for second-place finishes in three-tribe challenges (and in four-tribe challenges, but just ignored 3rd-place in 4-tribe challenges, because they're so rare and we didn't want to make another column). Regardless, TrChW counts just first-place wins. "Participating" in a challenge means not sitting on the sit-out bench. There are some challenges where multiple people theoretically unlock crates or untie knots, but only one person actually does it. These still count. Sorry. In cases of ties, the person with the best win% (including second- and/or third-place finishes) is listed first. TrChW: Challenge wins. How many times they won. TrChA: Challenge Appearances. The number of challenges in which they competed.